Advanced Digital Weighing Technology? 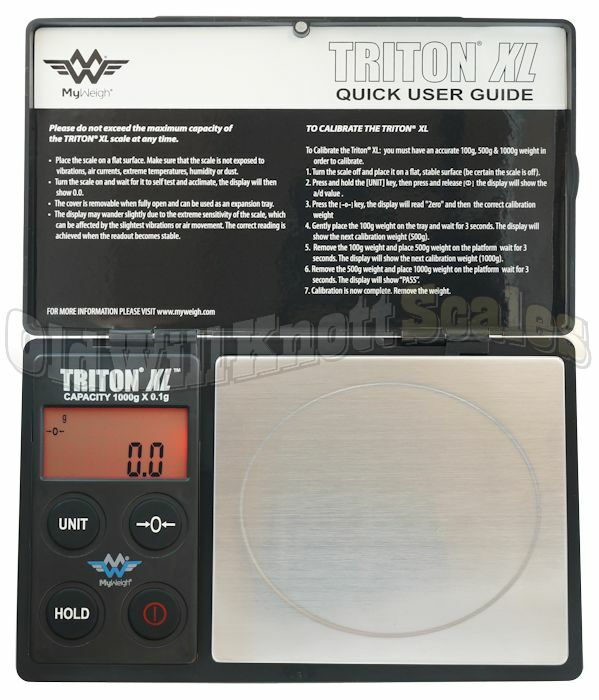 The Triton T2 1000 was built with true, 10,000 division German HBM weighing sensors. This Advanced Digital Weighing Technology is going to give you the most accurate weight readings. Bright Backlit Display The Triton XL 1000 portable scale has a fancy, red, backlit display to help ya see your weight readings, even in dim lighting. 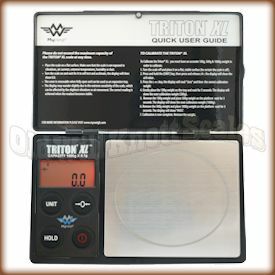 Easy Calibration The Triton T2 1000 portable scale comes factory calibrated and ready to use. Just in case ya need to calibrate it, the T2-1000 comes with easy to follow calibration instructions. 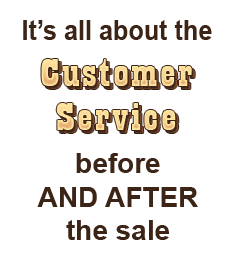 You'll just need to pick up one 100 gram and two 500 gram calibration weights to get the job done. Stainless Steel Platform The Triton T2 XL1000 has a durable stainless steel weighing platform to make cleanup a breeze. Stainless steel is great because it doesn't scratch easily and keeps its shine without rusting or tarnishing. It Has WeighMeter™ Technology! If ya put too much weight, (more than the capacity of the scale) on any scale it can cause permanent damage. Unfortunately, most scales warn ya of an overload after it's too late. Luckily this portable scale comes with WeighMeter Technolgy to tell ya when you're coming close to the maximum capacity. This will save ya from overloading your scale and damaging it beyond repair. It Remembers The Last Unit Ya Used If your application needs weights in the same unit of measurement, (like ounces for instance), it can be a real pain if your scale always turns on ready to weigh in grams. It's a good thing the Triton T2 1000 turns on displaying the unit of measurement you were using when ya turned it off. Energy Saving Auto-Off If ya have ever had the batteries in something run out because you forgot to turn it off, you'll realize what a blessing this feature is. The Triton XL will automatically turn off after about one minute of inactivity, saving battery power and money. I bought this to use with a swing weight scale project for golf. Wanted something that would be more consistent and accurate than the $10 models that I bought on eBay. But it is not any better, and pretty average at best. The platform is not flat and the on-off button sticks a lot. I may send it back for warranty replacement. But I'm not using it. I bought the scale to use with a group of home-schooled chemistry students, and they loved it. I'll use it in the kitchen too. Thanks for a great product and quick delivery! We really love this scale. We need it to weigh food for a person in the family with a medical condition. It's larger than the one we were used to, but its a beauty. It's larger, but not heavier,I love how the cover detaches to be used as a weighing tray. Very nice. We are wanting a scale for the purpose of measuring essential oil and ethanol for natural perfumes. Will this unit manage small batches of commercial production perfume production ok? Will you ship to NZ? How much will it cost for this unit plus shipping? Unfortunately we do not ship outside of the United States. Have you sold these units for perfumery before? As long as the unit meets you weighing needs in terms of maximum capacity and precision, you'll be able to use it for that purpose. Unfortunately we can only ship within the United States.